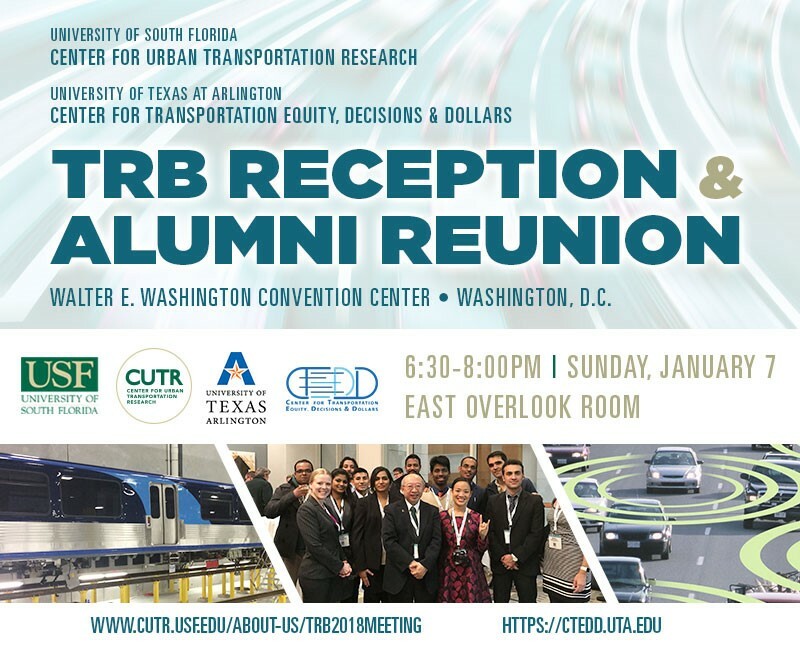 The Center for Urban Transportation Research (CUTR) at the University of South Florida (USF) was proud to participate in the Transportation Research Board (TRB) 2018 Annual Meeting in Washington, DC, which was held on Sunday, January 7 – Thursday, January 11. It was our pleasure to cosponsor our second TRB Reception and Alumni Reunion with the University of Texas Arlington CTEDD Center. The reception was held on Sunday, January 7, 2018, from 6:30 pm-8:00 pm at the Walter E. Washington Convention Center, Washington, DC at East Overlook. We hope you stopped by to connect with us.